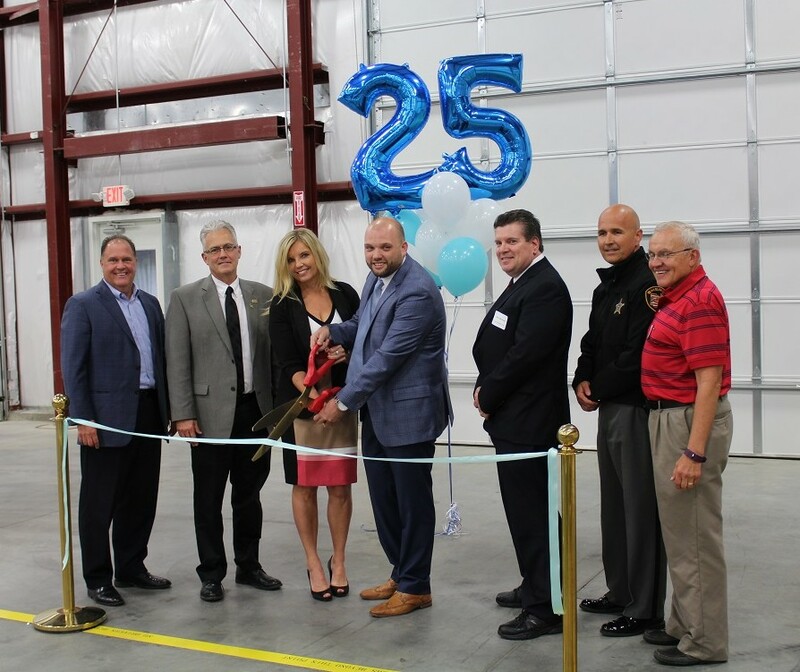 Slice of Stainless celebrated the completion of the expansion and marked the 25th anniversary of our founding in a ceremony held May 12, 2017. 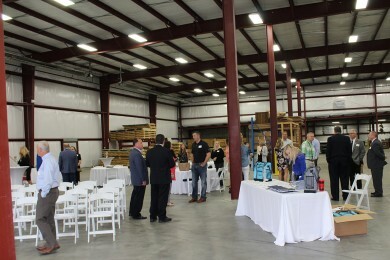 Local officials, customers and suppliers were on hand for the celebration. Left to right: Clermont County Chamber of Commerce President Matt Van Sant; Clermont County Commissioner David Painter; Slice of Stainless President Robin Tackett, and Vice President, Brandon Tackett; Union Township Trustee John McGraw; Clermont County Sheriff Steve Leahy; and Dr. Greg Sojka, University of Cincinnati Clermont College. 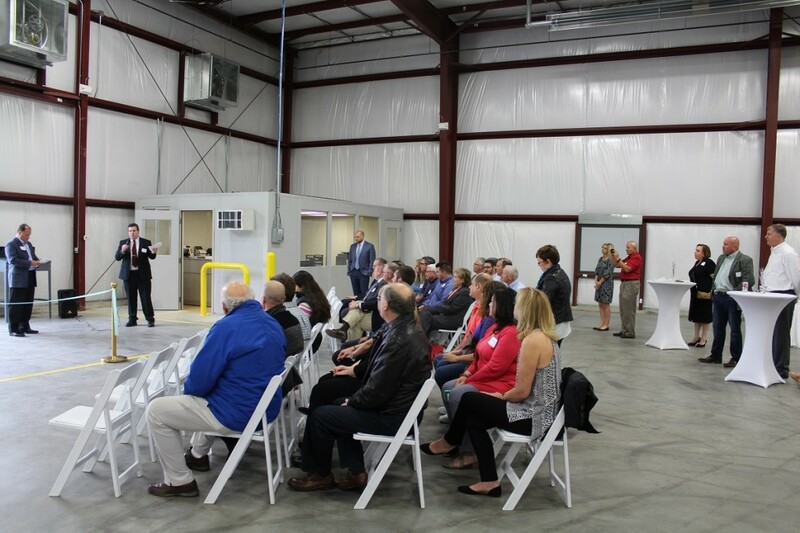 Clermont County and Union Township officials spoke of their partnership with Slice of Stainless. Robin and Brandon also spoke to attendees, and honored the memory of late co-founder Todd Reed. With the expansion complete, new racks are arriving and will begin to fill up with even more inventory. 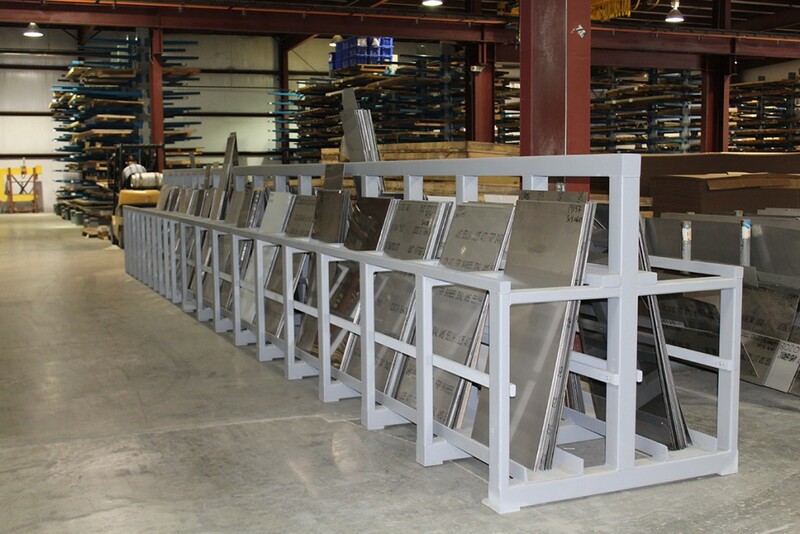 A new packing station and custom racks for drops will make filling orders even more efficient. 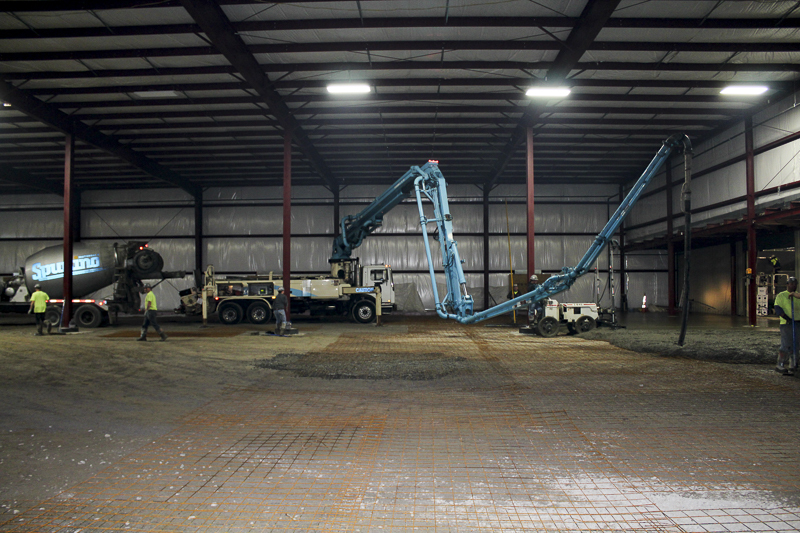 January 2017 found us closing up the building and pouring the main floor. Truck after truck arrived with a steady supply of concrete throughout the day. Each load was funneled into the feeder truck with a boom pump mounted on it. ...and a floor is poured! The loads of concrete were funneled into the main boom pump. From there the concrete was pumped out through a hose and directed with a long mechanical arm to the spot where concrete was needed. Teams of workmen directed the hose application and immediately began to level it to a consistent thickness. 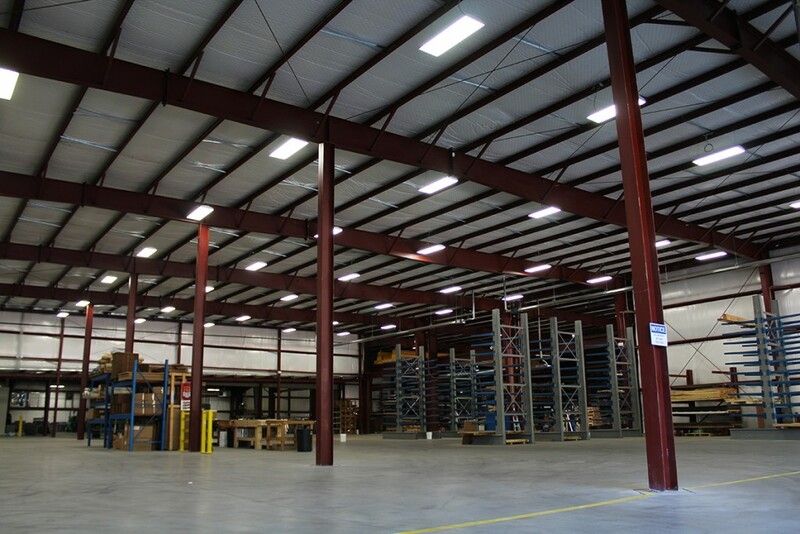 They started near the existing building and began working their way out to the freight bays. 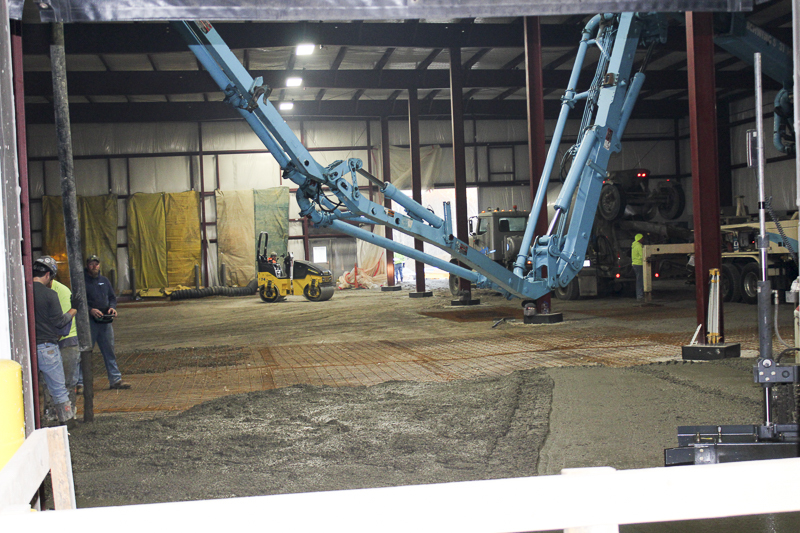 A riding trowel machine was brought in to begin troweling the still-wet concrete. 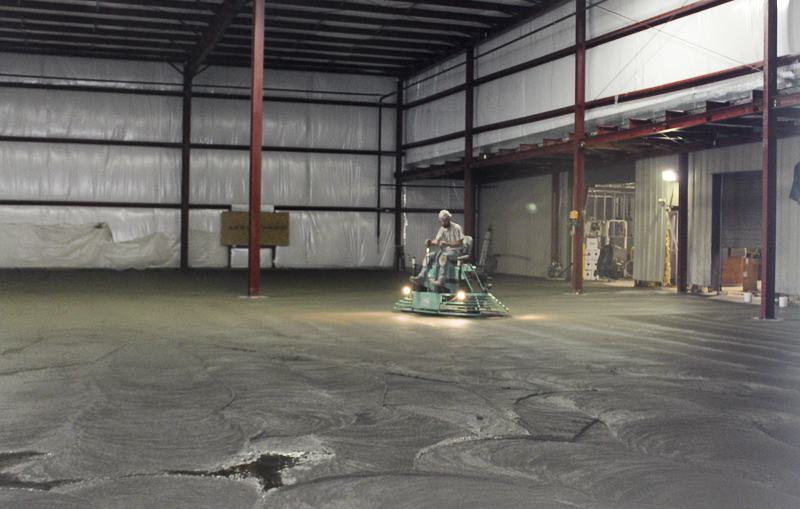 Looking like a space-age hovercraft, the machine spins in circles to smooth the concrete. Asked if he got dizzy working the machine, the operator said it’s just darn loud! In what has become a tradition, they marked the occasion in the wet concrete. 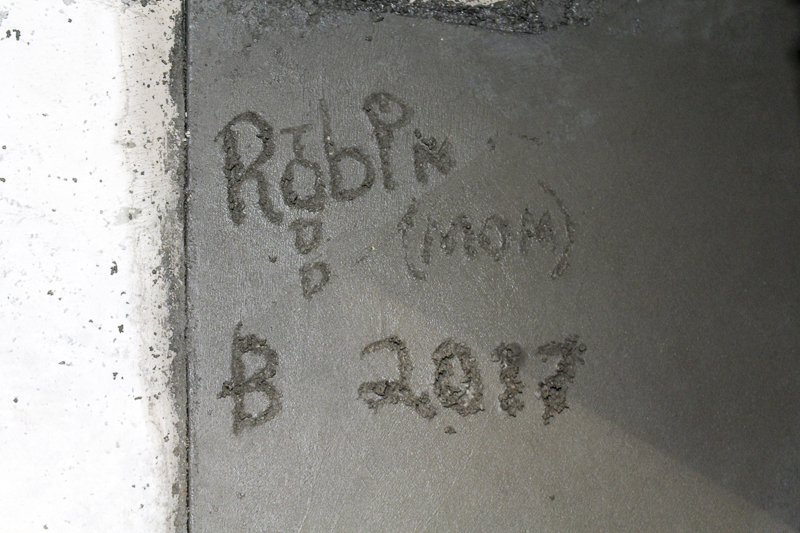 The last time we built an addition, founders Todd Reed and Robin Tackett wrote in the concrete to commemorate the occasion. This time mother and son duo, Robin and Brandon Tackett, did the honors. 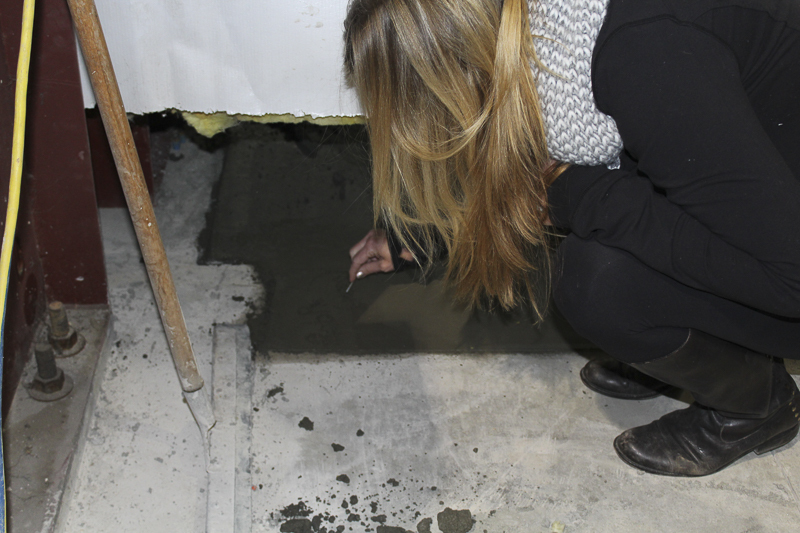 Standing on the hard concrete of our existing space, they wrote in the wet cement of the addition before it began to set. 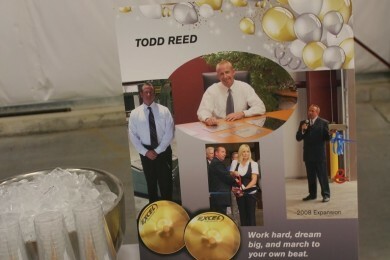 As always, the late Todd Reed is in our hearts. An impromptu moment had Robin signing for herself and Todd, and noting one of her most important roles: (Mom). Brandon followed with a classic letter “B” and the year 2017. 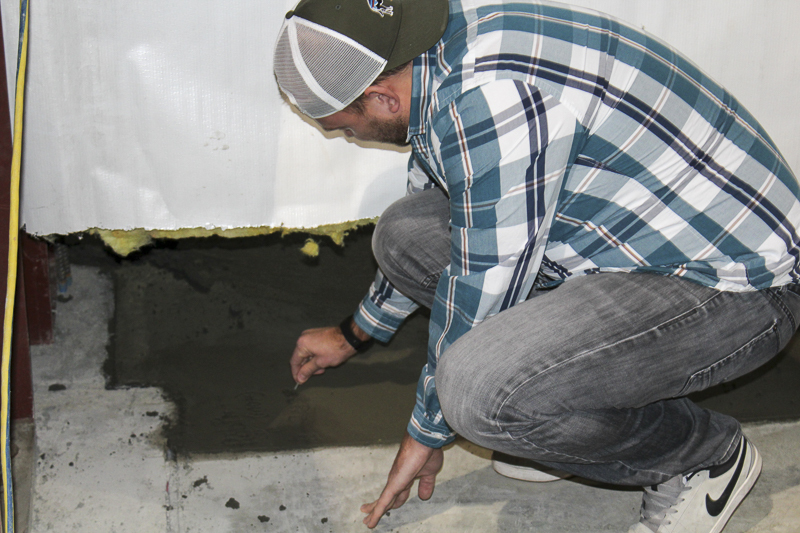 Small marks in the concrete, but another major milestone for Slice of Stainless. 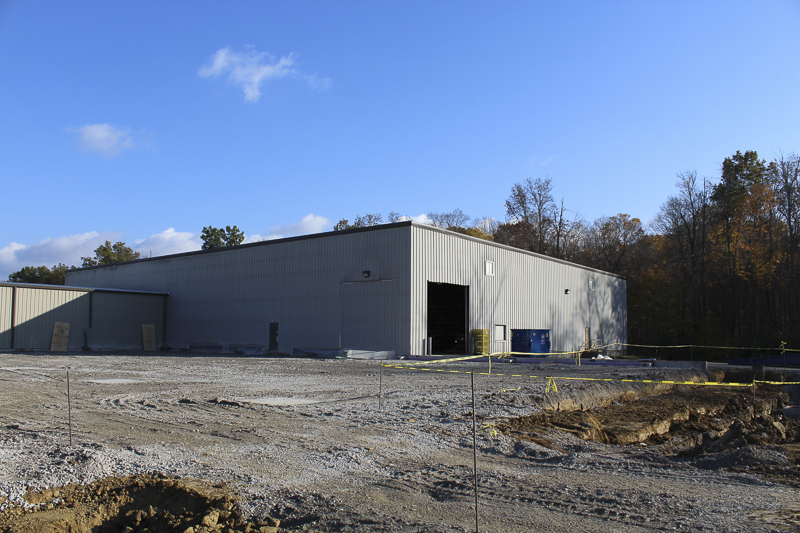 The newly enclosed building now measures 55,000 square feet and covers almost six acres. 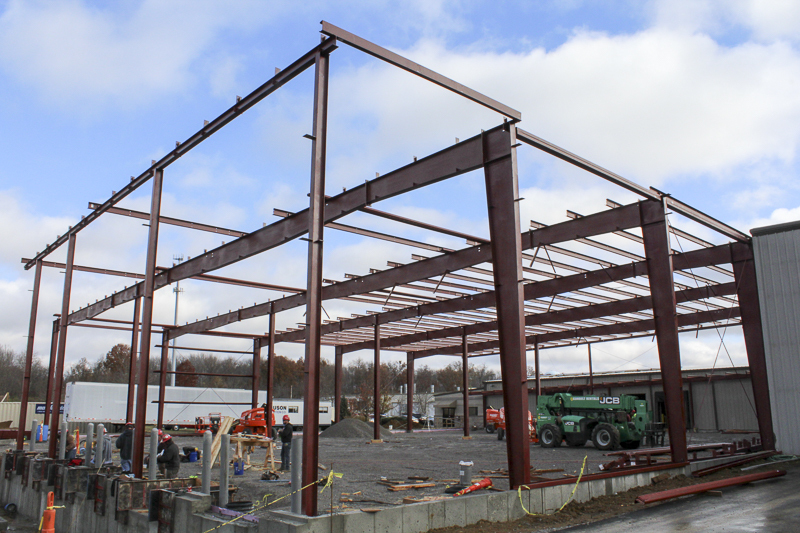 The addition measures 20,000 square feet. Interestingly, the average roller skating rink is similar in size, ranging from 18,000 to 20,000 sf. with a skating surface of around 11,000 sf. The sheen on the newly polished concrete floor does have us thinking about ice skating as well. Or maybe it’s just the January cold. 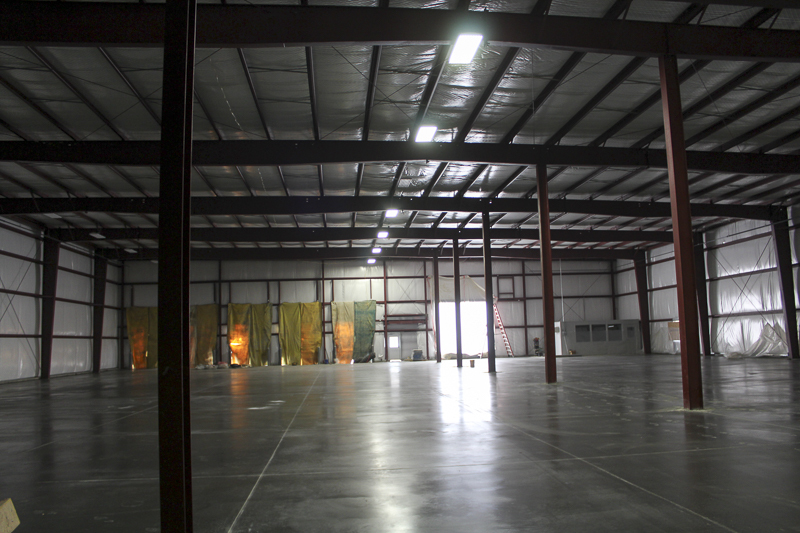 At left you can see the finished concrete floor and the location of five new truck bays covered with temporary tarps. At right are the same bays viewed from outside. Very soon, new doors will be installed to replace the tarps; and we’ll completely remove the walls separating old from new space. 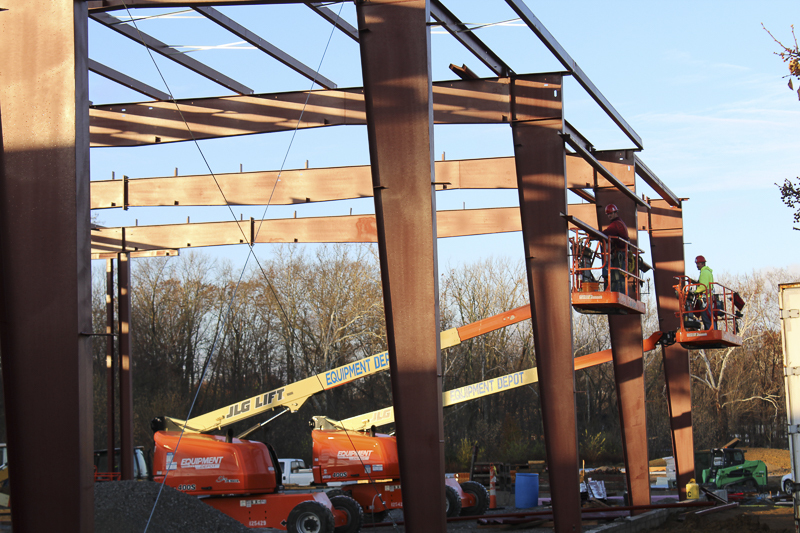 December was a busy month for the construction crew. With the building framework in place, it’s time to add walls and a roof. An interesting feature of the new roof installation is the security netting installed before the roof construction began. 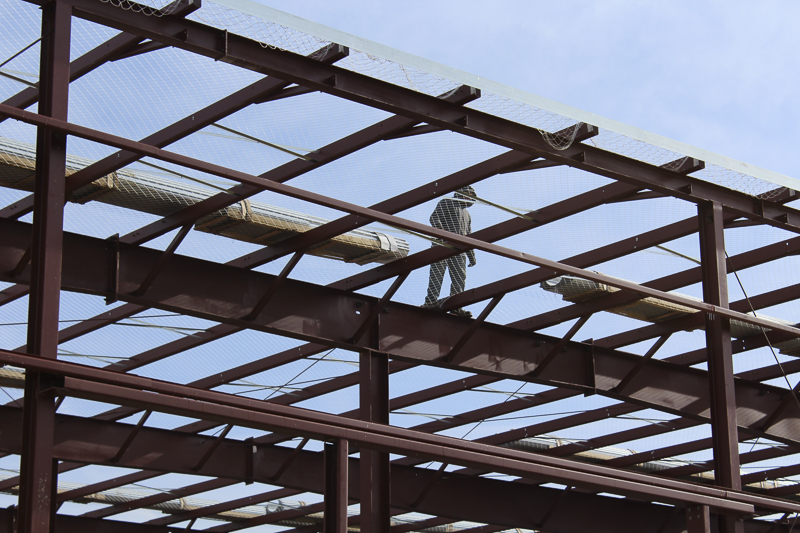 The net is strong enough to support a person if they should slip while working on the beams. The netting remains in place permanently as insulation and roofing are installed over the top of it. 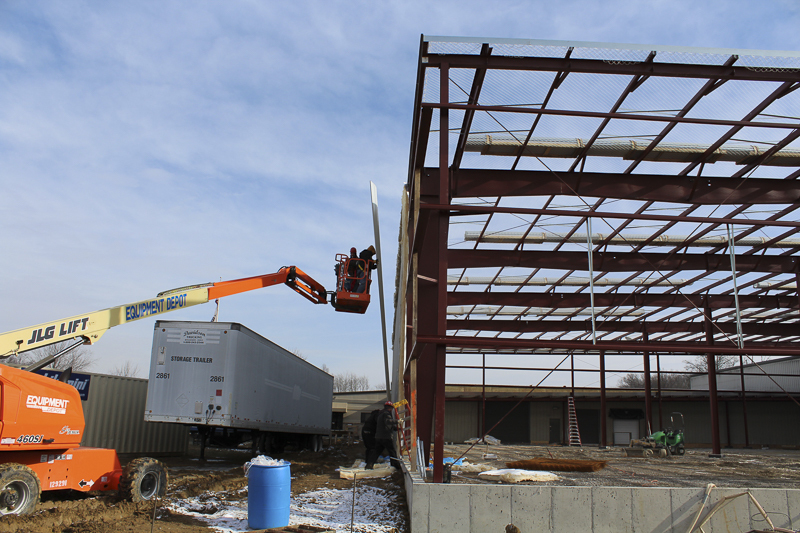 Siding begins to enclose the new addition, as the crew works counterclockwise from the existing office entrance, erecting the siding and insulation. The second photo shows the same wall from the opposite end (at its northwest corner.) The workers are just about to turn the corner on this wall and begin the west side where our new shipping bays are located. 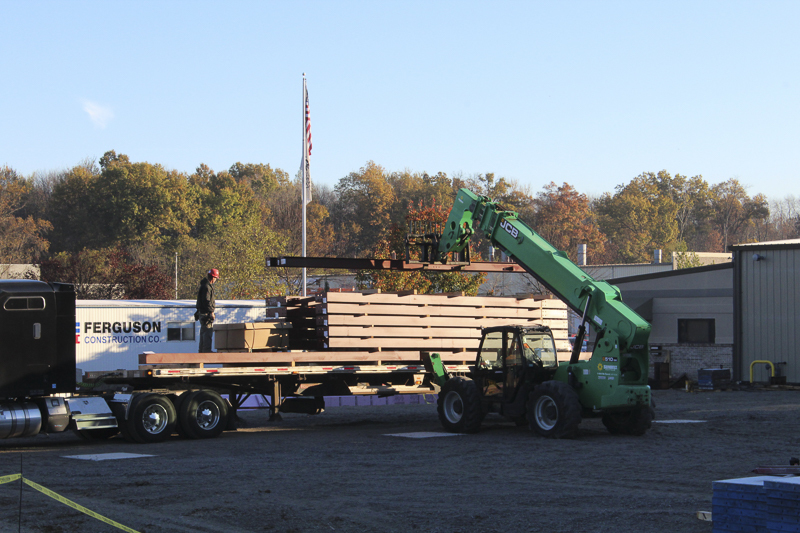 Roofing bundles are lifted onto the existing warehouse roof. Crews will install the roof panels on the new addition, working from the existing space outward toward the west wall of the expansion. The shipping office is being relocated to the northwest corner of our new space. 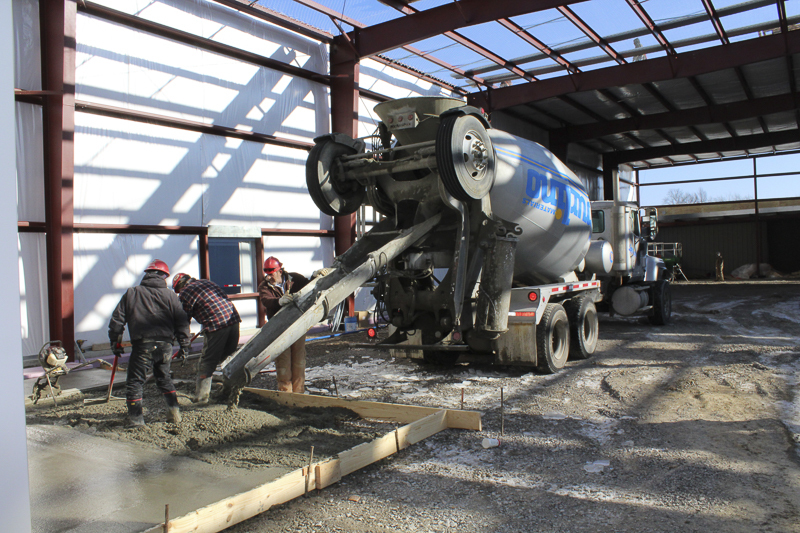 To prepare for the move, the crew poured a new concrete pad to serve as foundation. 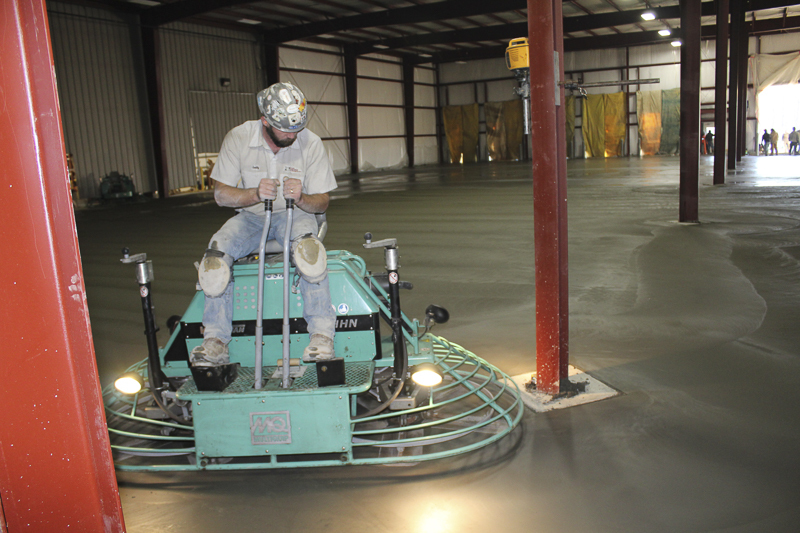 This will be set before the rest of the floor is poured to allow for the move. 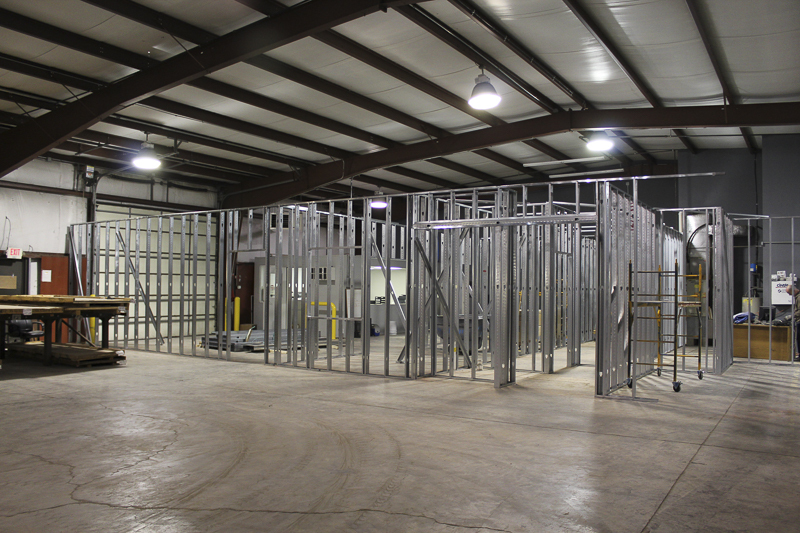 Metal framing goes up as the first step to increasing office space. The gray shipping office seen in the background will be dismantled and reassembled at the northwest corner of the expansion. This photo shows the addition nearing complete enclosure. 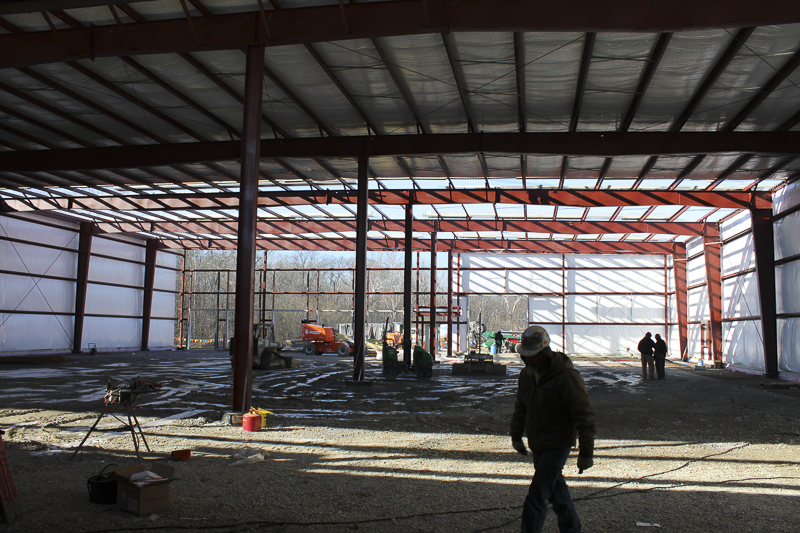 The view is from our existing space looking west where the five new shipping bays will soon be framed. Currently, the floor is a compressed gravel base. 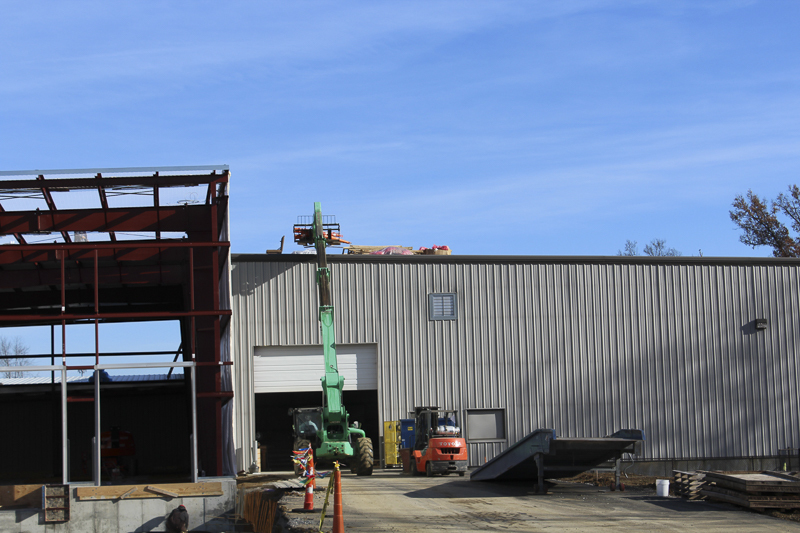 Roofing will continue outward, and the north and south walls are already in place. Since the walls went up, there is a definite sense of the volume of space added. 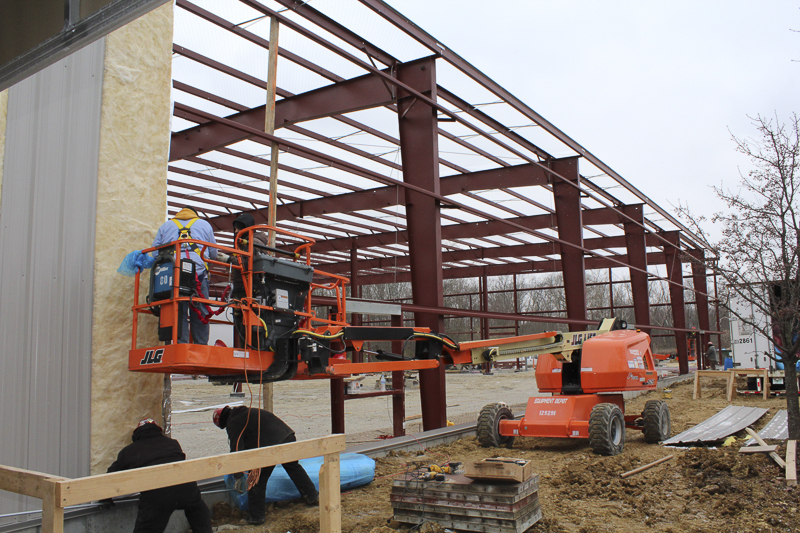 The addition measures 20,000 square feet. Interestingly, the average roller skating rink is similar in size, ranging from 18,000 to 20,000 sf, with a skating surface of around 11,000 sf. We’re thinking of requesting roller blades for every employee. Stay tuned on how that turns out. 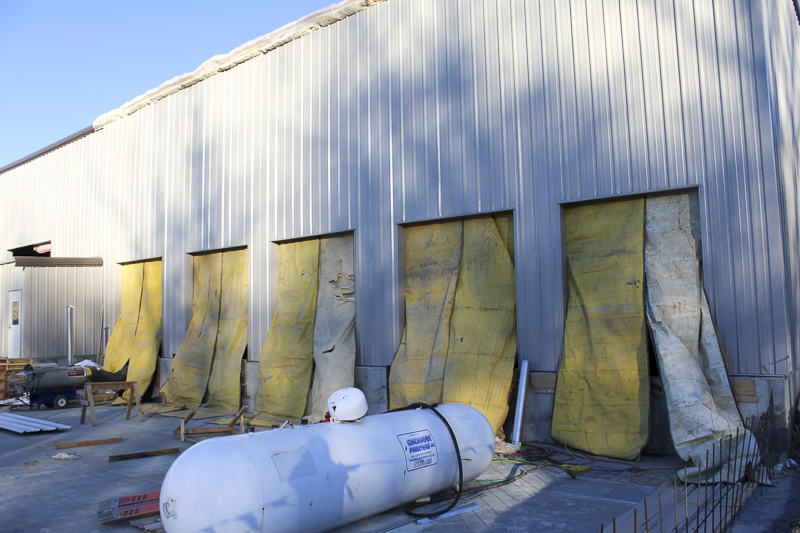 A view of the west side of the addition shows the nearly finished siding, and the location of five new dock doors. The ground leading to them was dug out to create a recessed ramp. 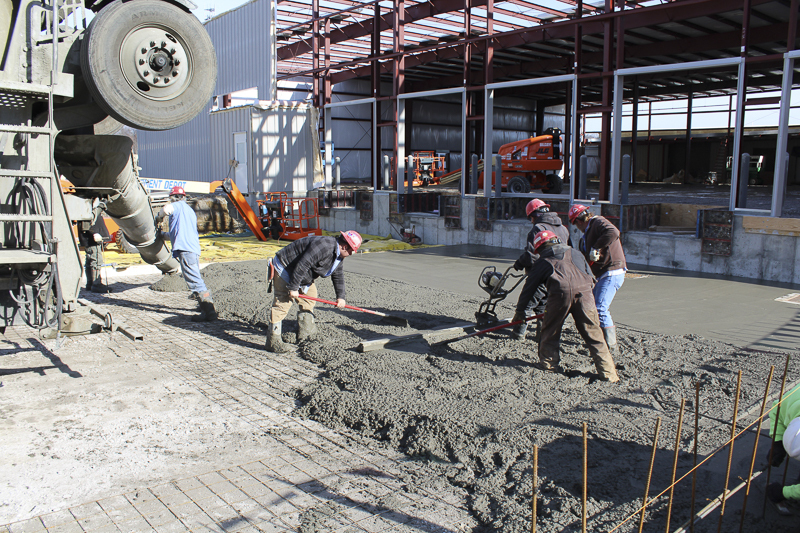 The second photo shows the concrete being poured and troweled for the new ramp. 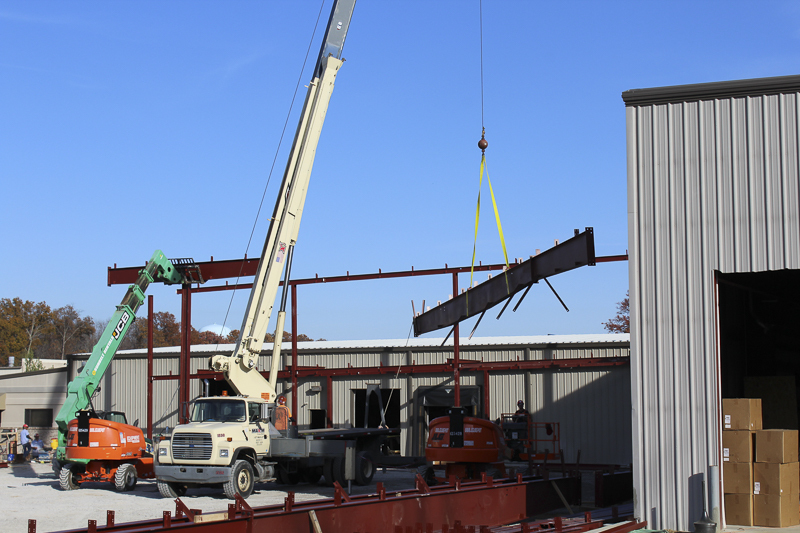 November marks the third month since we began our new building expansion. We’ve segmented the page to put the latest information here at the top. If this is your first visit, scroll to the bottom of the page to start the story! Was it four trucks or five? 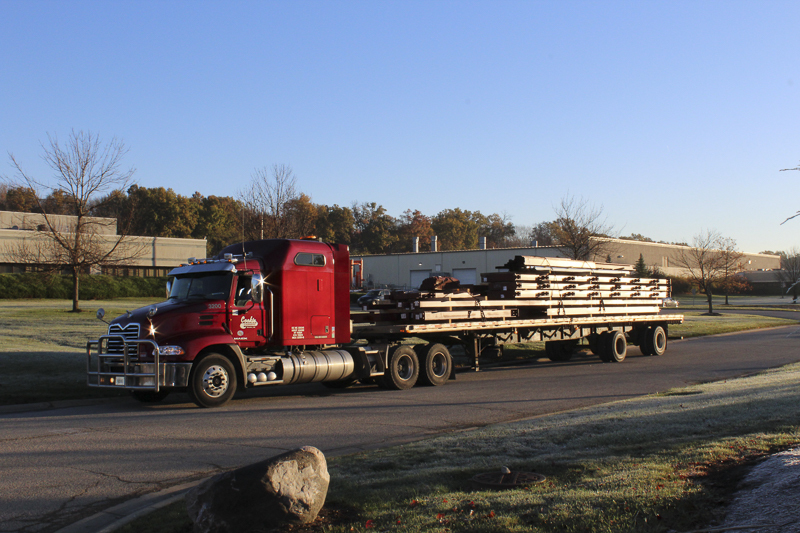 They were lined up at 7:30 am in early November to deliver all of the component parts of the new addition. Now that the ground has been leveled, a bed of gravel was put in that will eventually be covered with a concrete floor for the expansion. Remember that Erector Set you had as a kid? Well, we had a life-size warehouse version arrive on five trucks. Unloading took the better part of the day as special lift equipment and a skilled crew took heavy primed steel components off the truck and placed them on the ground. 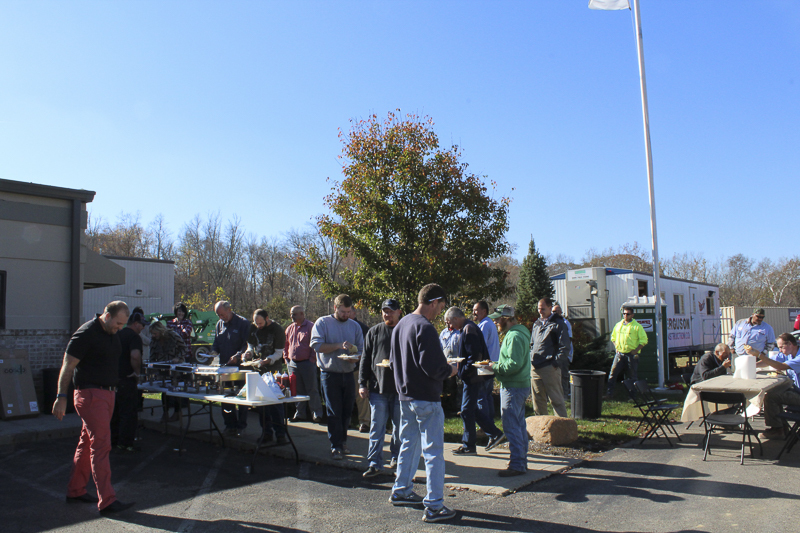 We had the chance to enjoy barbecue with the construction crew on November 10. Who knew we would luck out with a sunny day and mild temperature. Thanks to Bob Dameron, our financial advisor of many years, for arranging it all. 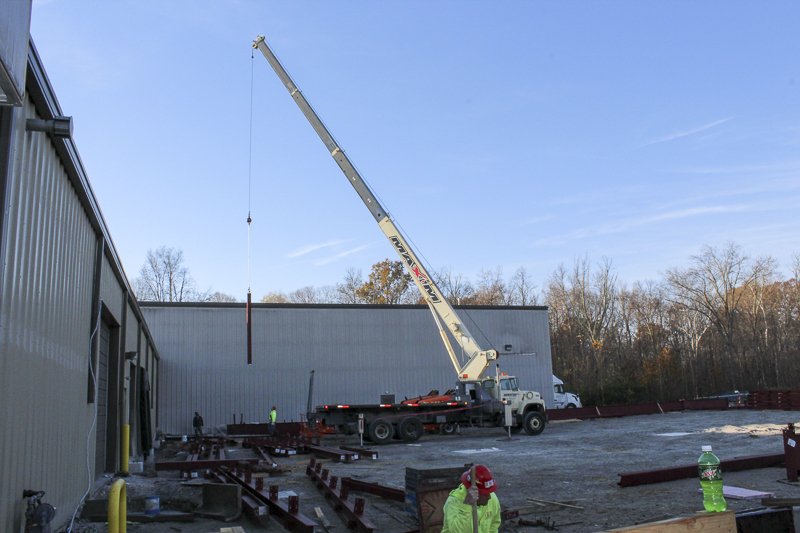 A gigantic crane lifts each post into place and the crew secures it to its concrete footing. The individual pad footings are placed at intervals to support the posts. Once the roof is in place the entire floor will be poured. The vertical posts were set one by one. Cross beams were added and guide wires held things in place until the framing is completed. 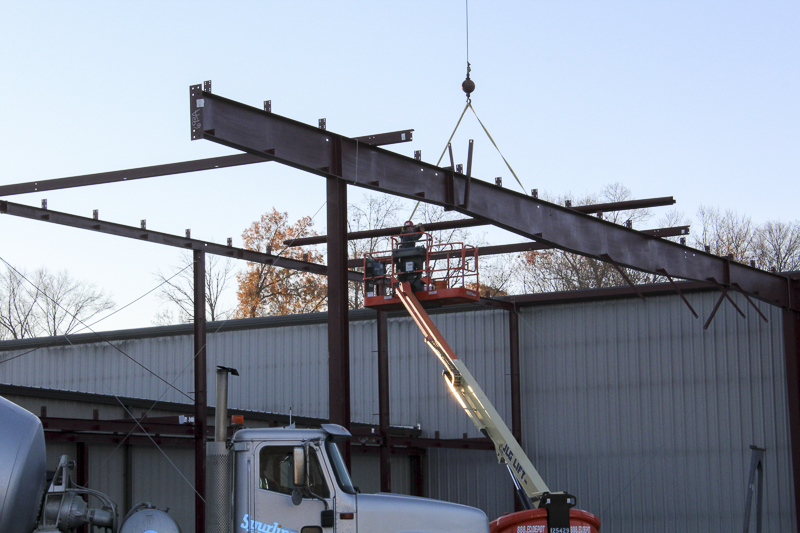 Working from the existing building outward, posts and major beams were lifted into place, followed by additional smaller cross pieces that will hold up the roofing. Men in two boom lifts coordinated placement of cross members. Each day was busy with lift equipment, placement and tying it all together. 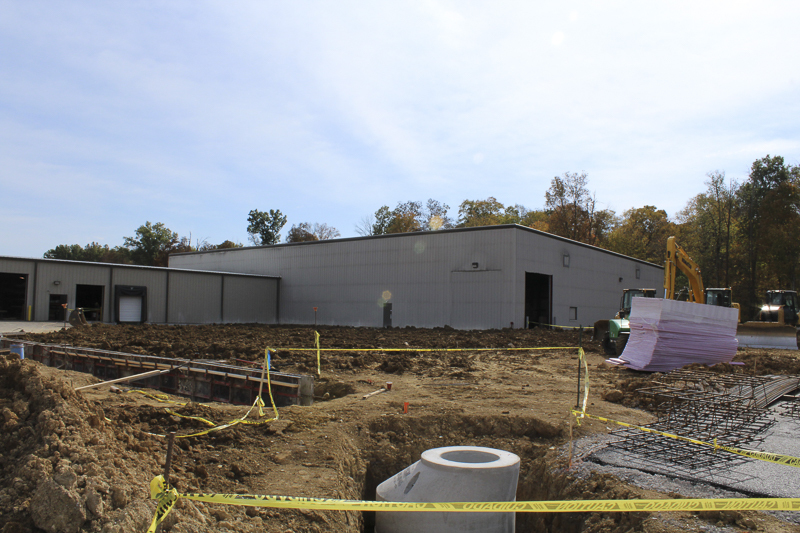 A view from the new freight area, looking back at the existing building, demonstrates the size of the addition. The existing building is shaped like a giant “L,” the expansion will fill in between the two wings. Any construction has to work around weather conditions. Luckily, we’ve been experiencing some crisp fall weather here in southern Ohio at October’s end. Perfect to get blacktop down on the new driveway to finish the new freight entrance. 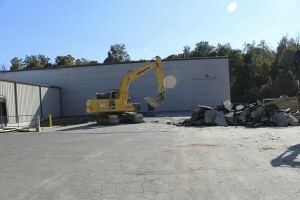 Next steps were to begin “deconstruction” around our existing loading docks. The new building will extend out over these bays and a parking area. That means breaking up asphalt and getting those recessed loading ramps filled in with dirt to bring all areas to an even ground level. All of that earthen mound created when the new sweeping drive was excavated will be put to use leveling the expansion area prior to pouring the foundation. When completed, the area shown to the right of the new freight entrance will add four more loading bays. 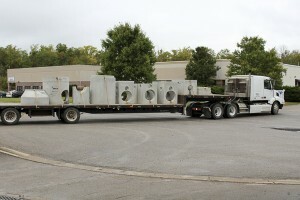 Large catch basins arrived and have been placed around the building and drive. 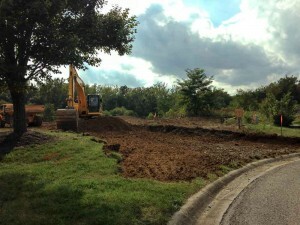 Trenches have been dug to put in the channels where concrete footings will be poured. The catch basin in the foreground marks the corner of the planned expansion. In the background at left are loading bays which will soon be closed permanently. With the blacktop nearing completion, we plan to use the new freight entrance and remove the last of the asphalt leading to the last bay. 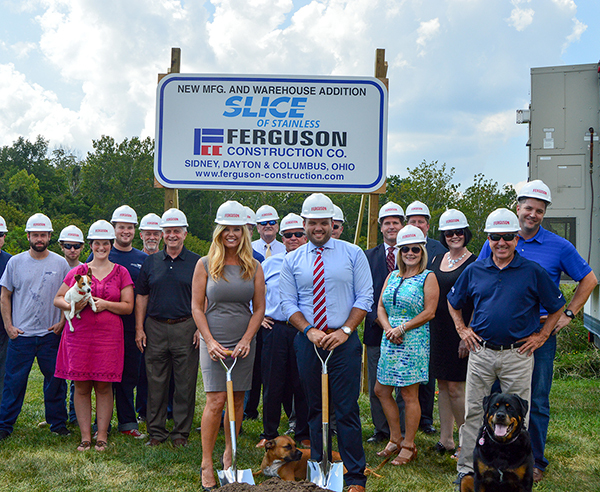 Slice of Stainless broke ground Sept. 6 on an expansion project that will nearly double the size of our Cincinnati headquarters to 55,000 square feet. 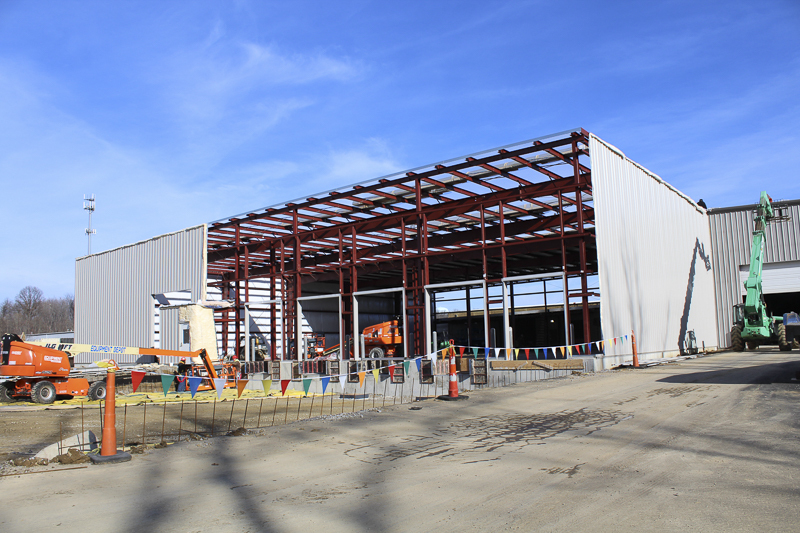 The finished facility will cover almost six acres and include increased warehouse capacity, additional shearing equipment and improved material handling systems. You can see media coverage on our blog post. Be sure to return and view updates as the construction moves forward! 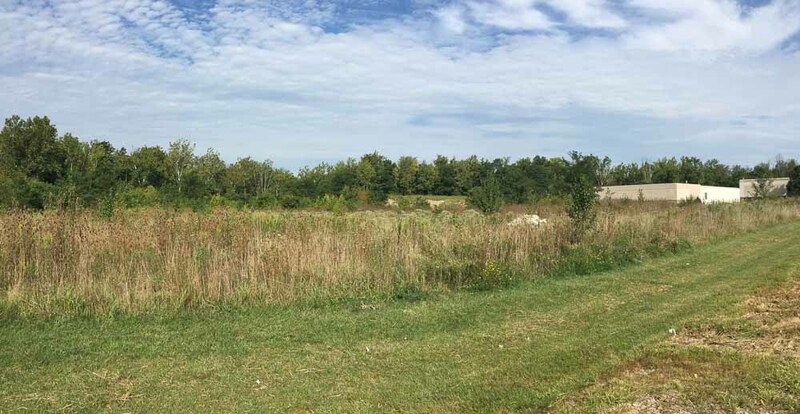 Looking north from one of our freight docks, this scene changed dramatically in just a few days as nearly four acres was cleared. 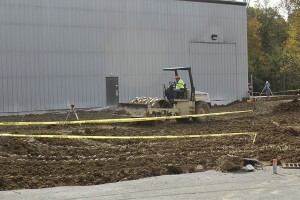 Earth moving equipment began leveling the field and excavating the expanded freight entrance mid-September. 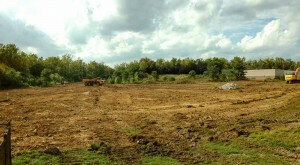 Above is a panoramic view from the front office, looking out at the acreage being developed. 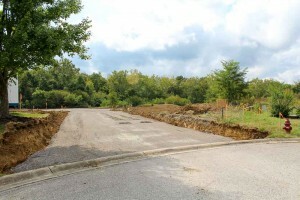 Photo below is the scene as you enter the existing drive. Soon this will be the site of the building expansion, and a new driveway will curve around the expanded facility. 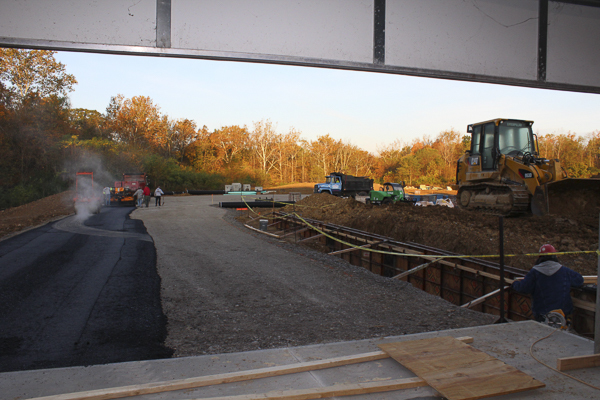 View to the north shows nearly 1,300 tons of crushed limestone forming the base layer for the new drive. Once the driveway is completed it will lead to a new loading dock, allowing for continuous freight service throughout the construction. 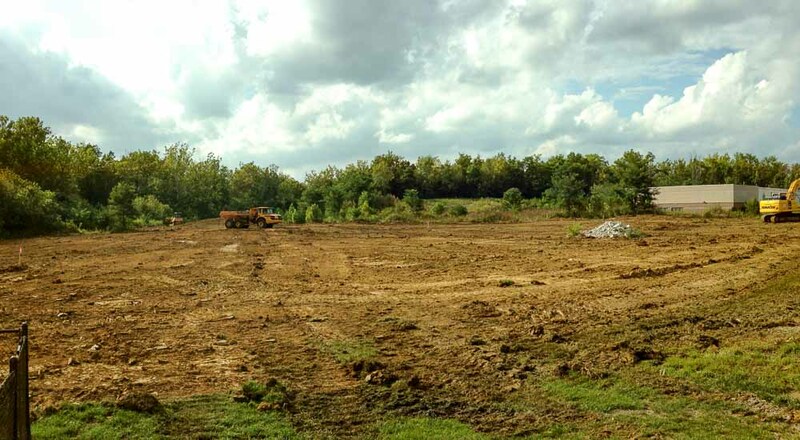 The 6-foot high earth mound at center will eventually be used to raise the ground level to the right to prepare for the new building.